This explains how the rough estimates of the area occupied by sheep in the UK were derived. By George Monbiot, published on monbiot.com, 11th January 2017. The total average consumption of lamb and mutton in the UK, both in and out of the home, is, according to the Agriculture and Horticulture Development Board, 5.0kg per person per year. 100g of lamb contains approximately 294kcal. So approximate annual average calorie intake from lamb is 14,700kcal. Annual average total calorie intake per person in the UK is approximately 1,250,000 kcal. Therefore lamb provides roughly 1.18% of our calories. Imports and exports are almost exactly balanced. The UK’s total cropped area is easy to come by. It is given by the government as 4,722,000 hectares. But there are no comparable figures for sheep grazing. Please note that the following gives very rough estimates/guesstimates of the area occupied by sheep grazing. It is remarkable that neither official nor academic figures are obtainable; it would be good to see this omission rectified. Industry estimates for deer stalking estates: 1,830,000 ha. Upland forestry/woodland: no figures available. I have used a very rough guess, going by satellite images, of 5%, giving 390,000 ha. Total left for grazing: 4,186,000. The second approach was to throw together all the sources of relevant information we could find, and use rough rules of thumb to try to make sense of it. In England, according to the government, there are 997,780 ha of land in commercial farms in severely disadvantaged areas (SDAs). 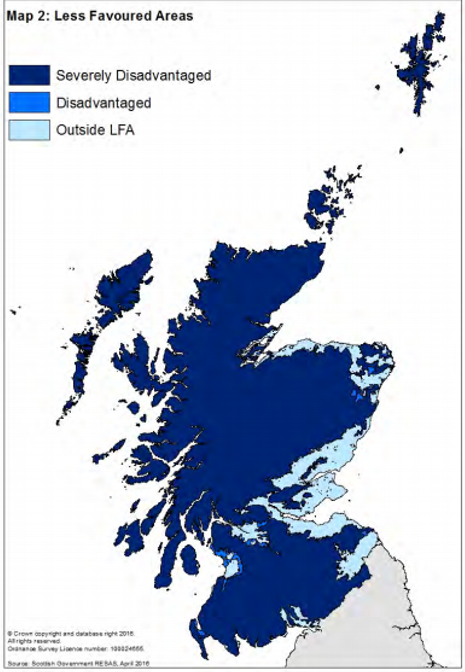 SDAs means uplands and other areas of very infertile land. Of these, 89% (roughly 890,000 ha) is used for commercial farming. 435,000 are occupied by sheep and 252,000 by mixed sheep and beef. If we were to allocate 50% of the mixed sheep and beef area to sheep, this gives sheep a total of 561,000 hectares, or 63% of the area in commercial farms. NB: these figures exclude common land, which covers large areas of the uplands in England, and is likely to be dominated by sheep. There is no comparable breakdown for Wales. 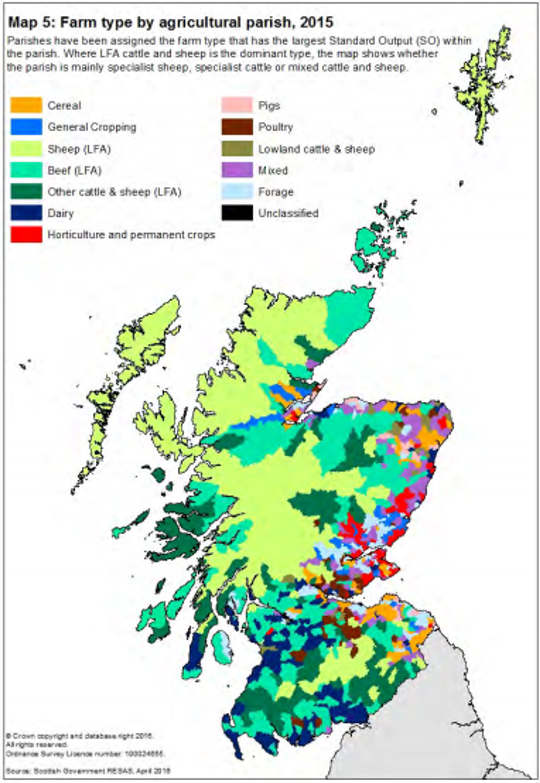 But the UK National Ecosystem Assessment states that agricultural land occupies 1,640,000 ha, of which arable land accounts for 162,000 ha, suggesting that livestock occupies the rest: 1,478,000 ha. If we were to assume the same distribution of livestock to that in the English SDAs, this would give 930,000 hectares of land occupied by sheep there. In Northern Ireland, there are 451,445 ha of agricultural land in severely disadvantaged areas, according to figures compiled by the RSPB. Applying the English proportion of 63% would give 280,000 ha under sheep. Let’s round this down, to reduce the likelihood of exaggeration. Any improvements on 4,000,000 hectares?